The gooseneck round is the lean, well-muscled part of the round. The meat generally has a rough texture and is relatively tough. 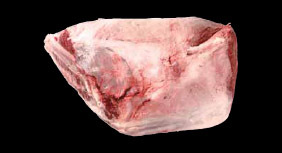 The gooseneck round is divided into three parts: eye of round, a cut that is paler in color and more elastic than other parts; the heel, a cut prepared for sale after removal of the M. flexor digitorum superficialis located in the center; and the outside round (gooseneck round) that is commonly used for stewing.